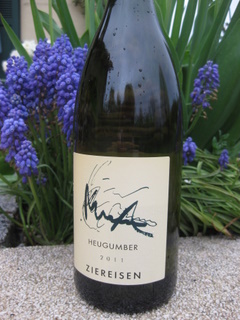 There’s only one thing wrong with Hanspeter Ziereisen’s wines: there’s just not enough of’em. After another delightful visit to the winery in Efringen-Kirchen (Baden, Germany) this week, we came away in high spirits – Hanspeter and Edeltraud are relaxed and generous hosts and tastings there are always a blast – but with the tiniest tinge of frustration that many of the goodies (well, the ones I like and can afford) are promptly ausverkauft, out of stock, épuisé, GONE…bummer. Must stir my stumps a bit sooner and sign up as soon as I hear the new vintage is in bottle. Or preferably before. We came in on the coattails of a Danish group of wine importers and enthusiasts, which gave Hanspeter the perfect excuse (not that he ever needs one) to wheel out the full range. Corks popped in between snippets of news of recent acquisitions/contracts (one with a local grower in the village for a perfect Pinot Noir parcel in the Feuerbach vineyard; another with the city of Basel for vines on the Riehener Schlipf, the hillside visible from the Beyeler Foundation). Info on yeasts (all indigenous), yields (a downward trend), new barrels (quite a few), prices (stable for entry-levels, increasing inexorably for the top wines) peppered the conversation. Hanspeter’s face (always reliably ruddy) got pinker and more animated by the moment. Their entry-level Grauer Burgunder (€8.80), also 2011, was a bit lean and hungry, lacking aroma, a tad dull. 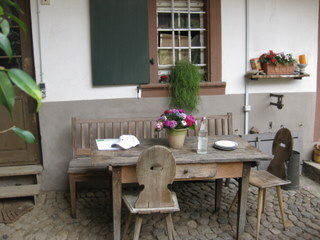 More interesting was the Weisser Burgunder 2010 (€18) from the Lügle vineyard up above Efringen – fresh, lively, bone-dry. In the same price range is their Musbrugger Grauer Burgunder 2010 which has a biscuity/toasty nose and good body. 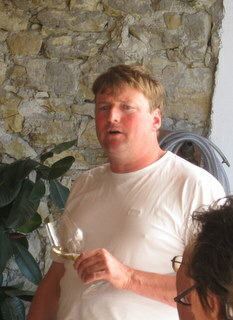 At the first sniff of Hanspeter’s Chardonnay 2010 (€26) – “our Meursault” – everyone sat bolt upright , then subsided again, deflated, at the news that it’s already sold out. The top-of-the-range Jaspis Grauer Burgunder (a mere 900-1200 bottles made p.a., 100% new oak in super-sized barriques) was superb – so it should be at €50 a pop (up from €30 last year). The wild card was an intriguing deep golden wine. “Any guesses?” asked Hanspeter. Silence, sustained sniffing, exchange of mystified glances…not a clue. “It’s an experiment”, he teased, then confessed it was a 2011 Gutedel, raised in all-new 600-litre barrels, no sulphur – a proper mouthful, rich with loads of promise. “This is the future!” he exulted, “Gutedel (Chasselas) is amazing: you can do so much with it, from basic to topnotch.” If he takes this one forward, it will be only with grapes from his top vineyards and made only in the best years. Reds were all 2010 vintage. Regent (“a highly successful and increasingly popular German hybrid“, Wine Grapes by Jancis Robinson, Julia Harding & José Vouillamoz) was deeply coloured, elderberry-jammy and remarkably low-alcohol (11%) – never tasted it before and not sure I’d go out of my way to taste it again. Finally we graduated to Spätburgunder (Pinot Noir), the wines that have won Hanspeter countless awards, a faithful following and ever-escalating prices, and ensured that his name has travelled way beyond the confines of this tiny village at the southern end of the Baden vineyard. His basic Spätburgunder 2010 (€9) is, IMNSHO, not worth the bother, on a par with (tho’ admittedly cheaper than) a rather average entry-level Burgundy. Keep your money (you’ll need it) for the better bottlings from older vines with varying degrees of oakiness and some bottle age. A notch up from the basic bottling but still nothing to write home about is Spätburgunder Tschuppen (a loess vineyard), which sees no new oak. With Spätburgunder Schulen (€22) things began to get interesting, both price- and flavour-wise. Then the dread words ausverkauft/sold out were uttered. (To my delight I managed to snag a 2009 magnum.) Spätburgunder Rhini (€34), another named vineyard (this one limestone-clay shot through with iron oxide), was juicy and a touch spicy, reminscent of a Gevrey-Chambertin, with a spell in barrique of which 30% new. Top of Ziereisen’s range are the wines labelled Jaspis. 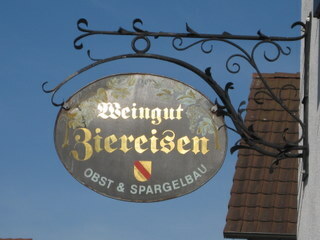 They’re all made, explains Hanspeter, from old (i.e. 50 years +) vines that managed to escape the predations of his predecessors, whose practice was to systematically uproot and replant anything over 20 years old. Spätburgunders from the Jaspis range are labelled Pinot Noir in deference to their distinctly Burgundian style; all are unfiltered and spend 22 months in oak, some of it new. Jaspis Pinot Noir 2010 (€45) was subtle, elegant and yes, altogether Burgundian. Last came Jaspis Alte Reben Pinot Noir 2008 outrageously delicious, predictably pricey (€70) and out of my range. The final two were Syrahs. Syrah, I hear you cry, the Rhone variety par excellence in Baden, Germany? Wonderful, innit, what global warming can do… Gestad Syrah 2010 (€22) is a spicy (cloves?) mouthful with good backbone, a bit like an elegant and not overly austere Crozes-Hermitage. We wrapped things up with a Jaspis Syrah 2010 rich, complex and elegant with an astonishingly low alchohol tag of 12.5% – and a stiffish price tag (for Baden) of €50. Shiraz in the Pfalz, that is astonishing. Global warming indeed. Shiraz down under is much bigger than it used to be – 14.5% -15% is the new normal. Not my idea of fine wine but lots of people like it. Hi Kim, good to hear from you – s’amazing how what were formerly southern varieties (for us) are edging ever farther north. Ziereisen is actually in Baden (close to Basel), which is a smidge to the south of the Pfalz and almost certainly warmer, but for sure there are growers up there also doing Syrah/Shiraz. Can’t remember if we took Paul to see Ziereisen, but think we probably did. Next time we shld explore the Pfalz with him! Thanks for the link to yr blog, will go have a look.